ATI Performance Products, Inc. is proud to introduce its Super Damper for the 2008+ Evo X with the newly released 2.0L turbocharged engine. The Evo X damper is offered in a 3% under drive (p/n 918253) for improved dampening and increased power. Unlike unbalanced underdrive pulleys, which offer no protection to high performance engines, the ATI Super Damper provides balanced dampening of torsional crankshaft vibrations. The 3 external bolts allow for the mounting of A.R.E. 's dry sump mandrel to the damper (A.R.E. 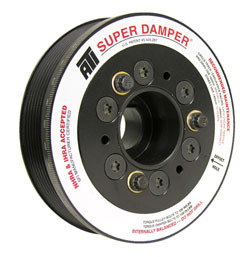 p/n 2750B).The ATI damper comes with 360º laser-etched timing marks and exceeds SFI 18.1 Safety Certification. Want this item shipped out today, April 22? Order within the next 4 hrs 18 mins.